I'm sorry I didn't have time to decorate much yet, but I had to share this. 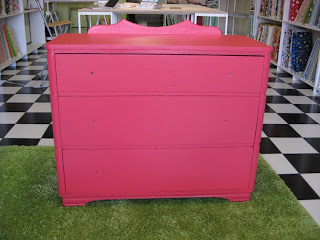 We bought this really cool vintage dresser at the Swap Meet for $20, and my Sweet Hubby Painted it on my B-Day for me. What a Star! It's has a Round Mirror that goes in the Scallop at the top, but it was little flimsy so we didn't mount it. Do you love it? I need to find some great knobs. Any suggestions? I would love to find some wood-carved mushroom drawer pulls if something like that existed, maybe in lime green? Any one seen anything like that? so cute... I need one! So cute - I bet you could paint some yourself. Just get those unfinished wooden knobs that look like mushrooms - paint them lime green with a white stem and add little white dots to the top - It probably wouldn't take that long. Happy, happy birthday. Congratulations on your store. I am so excited for you!! I hope to be in your shoes sometime soon too! Duh! I just bought those unfinished knobs and I'm going home to paint! Cool! Happy birthday, Lady! What a great dresser - he's deifinitely a star!